I mentioned last week that one of my more unusual Christmas Days was spent in Japan, the particularly unusual part being that for the first time in my life I had to go to work on Christmas Day. It was probably the first day in my new life abroad that I felt a little homesick, thinking of my family gathering back home with their prawns and swimming pools, without me. Being Christmas, I decided to spoil myself – and challenge myself at the same time. In a long-planned event, after work on Christmas Day my boyfriend at the time and I decided to order a pizza delivery. This may seem a very simple thing, but first of all, you have to realise that the cost of a pizza delivery in Japan was (and perhaps still is?) utterly ridiculous. Instead of a $9.95 deal, if I remember correctly the cost of a single pizza with home delivery was closer to $50. But yes, it was Christmas. The challenge part was that I was given the important job of phoning up and ordering the pizza. In Japanese, of course. I had been learning Japanese for just a few months at the time and hadn’t thought to ask my teacher to help me with pizza-ordering phrases before we finished up for the end-of-year break. So I practised and practised and then made the call. Voila! This was delivered to our door, with the lovely touch that the delivery man wore a Santa hat, giving us some reminder of the festive season. 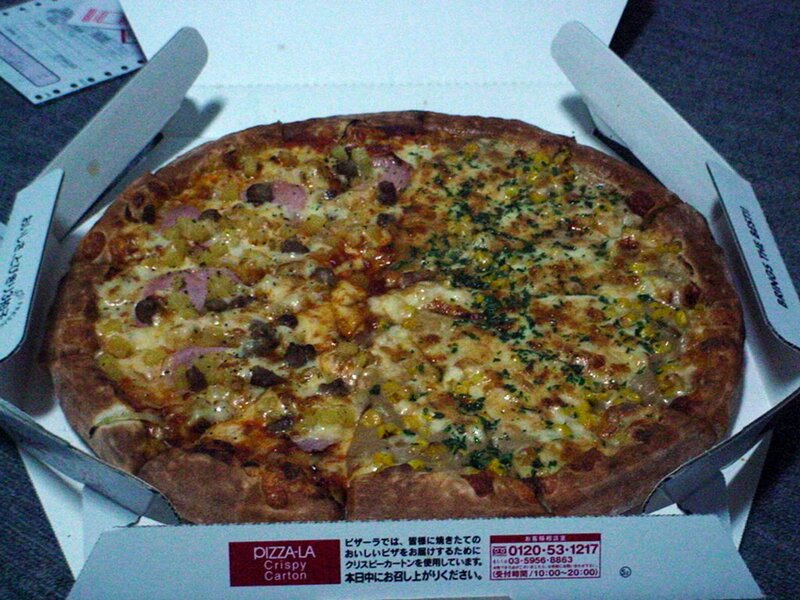 As you can see, I was clever enough to order half-and-half and though I don’t quite remember all the toppings, I can see both included corn, and corn was a surprisingly common ingredient on Japanese pizzas. It’s a great feeling when you can actually order something in a new language. It’s such a hard language to learn, I hope you’ve kept up your skills! I have to admit Jenny that my Japanese has lapsed a lot – I can still understand a fair bit but not speak – on the other hand my German has improved so I can’t do everything, at least not at the moment! Japanese is such a fun language though. It is hard to learn Japanese language. Just kinda wandered on your blog from another blog. Cool post about ordering in japanese…that is impressive! Did you avoid mayo on your pizza? I was always scared about that when ordering in Japan.